Data released today by the Local Data Company (LDC) and the British Independent Retailers Association (bira) shows that traditional independent shops opened significantly more shops than in the same period last year, whilst the national chains (with more than five stores nationally) continued to see a fall. Independent shops saw an increase of +762 shops (+0.27%) in H1 2017. This is a significant rise from the net increase of +4 shops (+0.00%) in H1 2016. A net increase of +562 units in H1 2017 on the high streets was one of the main drivers in the growth of independent retailing in H1 2017, with this being a +181% increase from the +200 unit growth in H1 2016. 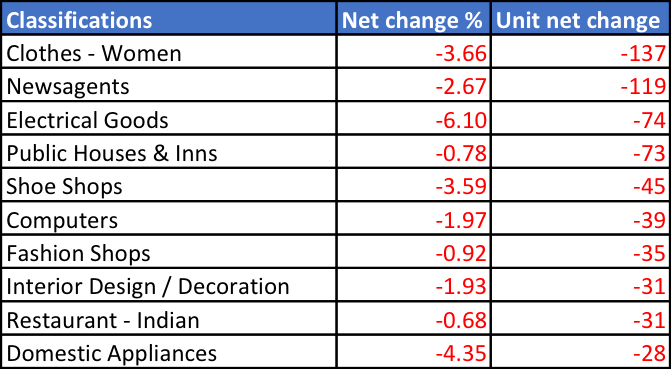 The chain retailers have also remained in decline with a net loss of -659 shops (-0.33%) in H1 2017 across GB, which compares to -2,001 shops (-1.02%) in H1 2016. +4 (+0.00%) in H1 2016. In H1 2017 a total of 28,076 Independents either opened (14,419) or closed (13,657), -10.1% down on H1 2016 where 31,216 opened (15,610) or closed (15,606). Comparison Goods Retail (non perishable goods) shops net change was -0.74%in H1 2017 (-0.89% in H1 2016). This is a net decrease of -596 units, an improved figure from -698 in H1 2016.
Leisure (restaurants, cafes, bookmakers & entertainment) growth has increased by +0.55% in H1 2017 compared to +0.06% in H1 2016. In H1 2017 there was a net increase of +475 units versus a net change of +45 units in H1 2016. Convenience Retail (bakers, butchers, food shops, & supermarkets) saw a net increase of +24 units (+0.08%) in H1 2017 versus an increase of +219 units (+0.81%) in H1 2016. Service Retail (health & beauty, financial services, tattoo parlours and estate agents) increased by the greatest number of units, an increase from 2016 at +859 units (+0.94% in H1 2017 versus +0.52% in H1 2016). Key growth sectors have been Barbers, Cafes, Tobacconists/e-cigarette shops, and Hair & Beauty salons. Sectors in decline include Pubs, Women’s clothing shops, Newsagents and Electrical goods. Tobacconists/e-cigarettes (+11%) and Brazilian restaurants (+34%) have increased the most as a percentage of their total units. The North West showed the greatest increase of Independent stores at +230 units (+0.71%) in H1 2017, versus +14 units (+0.05%) in H1 2016. The East of England and the South West showed the greatest decline of Independents at -19 units (-0.09%) and -29 units (-0.11%) respectively. Scotland has continued to see a change in fortune, with an increase of +114 units, up on the +63 unit increase in H1 2016 after the net decline of -42 in H1 2015. Sparkhill, Birmingham has the accolade of having the highest percentage of independent stores at 95.0% (based on locations with 50+ units) for the second year running. 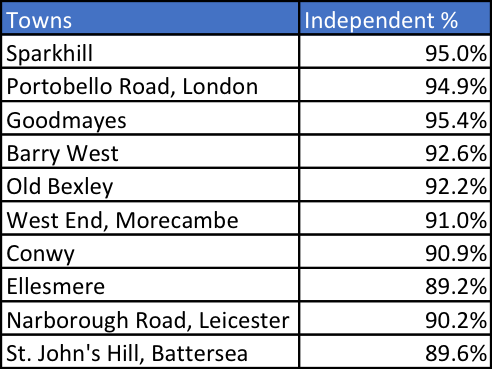 Telford is the town with the lowest percentage of independents at only 15.5%, against a GB average of 65% (based on locations with 50+ units). Wider analysis of in and out of town locations shows that High Streets saw dramatic improvement from a net increase of +200 units in H1 2016, to a net increase of +562 units in H1 2017. 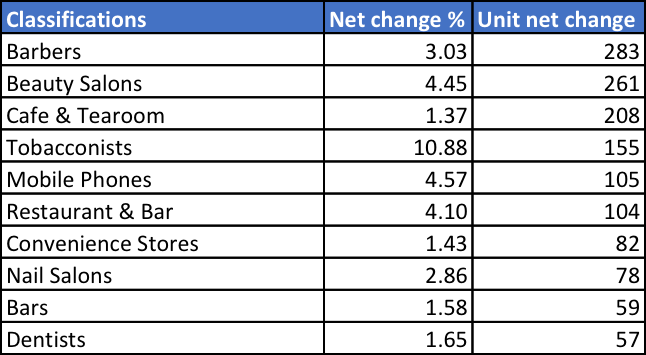 This represented a +0.34% net increase, a +362 unit swing from the +0.12% net increase in H1 2016. The other location types saw an overall increase with Shopping Centres seeing the first net increase in 2 years of +0.67% (versus -0.61% in H1 2016) and Retail Parks edging up by +3.41% (versus +0.63% in H1 2016). Independents account for 65% of all retail and leisure units in Great Britain, the same as in H1 2016. “The first half of 2017 has seen remarkable growth in the opening of independent shops and food and beverage outlets across Great Britain, with a net increase of +762 new trading stores. This is significant in what is a challenging environment and where many chain retailers are closing stores. 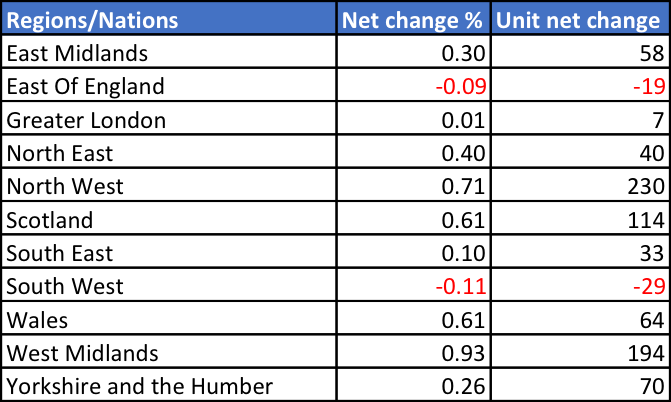 Of note is the 10% reduction in overall activity (openings and closures) as this reflects increasing uncertainty in the market or where opportunities to invest are reducing. As the numbers show, independents are an increasingly important stakeholder in every town centre up and down the country and therefore an understanding of how they are performing is key. 65% of all the retail and leisure units across Great Britain are independents and this number has increased in recent years. The internet, customisation and providing a personal service is something that will fuel the openings of independents on our high streets. “It’s good to see independents and the high street in particular, leading the way in net unit growth for the first half of 2017. The courage and we hope skill of the independent entrepreneurial spirit will fly long after the prophets of doom are silent.